Hello Internet, Asian Phil here. 2011 is coming to an end, Christmas has already snuck up on us; holiday merchandise and decorations have flooded the nation before Thanksgiving even had a chance to start. 2011 is a pretty exciting year in term of motorsports, many glories and tragedies. Any racefriv fans who are into fast toys are pretty much motosport fans as well. Why Motorsports? Mankind likes to compete, compare, and excel; the history is written by the victor and it always has been. People like to compare starting in childhood: height, report cards, Pokemon cards, body weight, bra sizes, salary figures, houses, lawn color etc. In the world of cars and motorcycles, when the comparison can not be settled on paper, the victor has to be determined elsewhere. Pull your pants up and put the ruler away boys, this is the highlight of 2011 Motorsports. Read below for all the info you need for 2011! Arguably one of the most entertaining seasons in a decade. 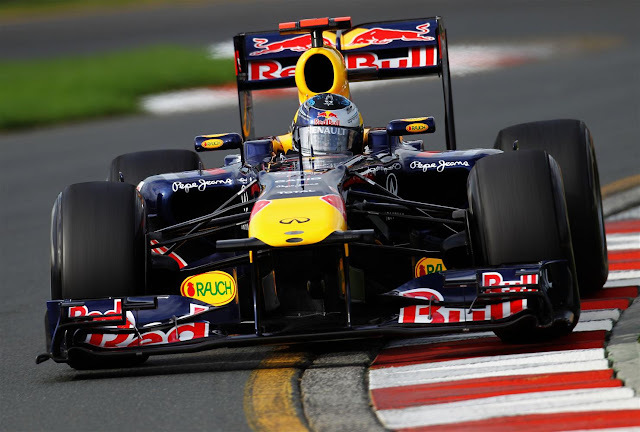 Pirelli tires became the official spec tire manufacture for Formula one in 2011. KERS (Kinetic Energy Recover system) is back, Double diffuser and F-duct is banned; the DRS (Drag Reduction system) is introduced, and for the first half of the season something called a "Blown diffuser" was used. For years, most passing in Formula one only happened in the pit lane; in other words, not much wheel to wheel racing. Teams only passed a rival with pit strategy. Even with extraordinary technology, race fans don't like to watch these multimillion dollar spacecraft doing parade laps. FIA introduced DRS this year, which allow a trailing car (within 1 second of the lead car) to open up their rear wing element. Similar to F-duct, this stalls the upper element, reducing downforce and drag to aid straightaway speed. Many purists argue this system took away the prestige of Formula one skill and its high standards; but on the flip side, we have seen some pretty amazing passing in this elite open wheel racing season. Sebastian Vettel from RedBull Racing took the 2011 Formula One World championship crown once again. victor, I don't know who else deserves that title. Beside this German bright star, the 2008 F1 World Champion Lewis Hamilton is also a highlight to the 2011 F1 season. His often mishap/tangle/battle with Ferrari driver Felipe Massa and visit with the race steward became a common sight this year. I love this British bloke and I hope he will mature a little in 2012 and make us proud. Not that I don't like Vettel but last thing that we need is another Michael Schumacher right? MotoGP: 2011 is the last year of 800cc era. Ever since FIM switched from 990cc 4 stroke to an 800cc machine, high cornering speed and a state of the art traction control system is the key to success in prototype motorcycle racing. Aussie Casey Stoner is the first person to win an 800cc era MotoGP world crown, and he is also the last person to win the 800cc MotoGP class as well. In 2012, MotoGP will allow up to 1000cc engine displacement, hoping for more tire shredding, sliding, and exciting racing. Casey Stoner is the only person who won the 800cc MotoGP class world championship with two separate manufactures. He won his first world crown with Ducati and his latest world title with Honda. The Greatest rider of all time, 9 times World Champion Valentino Rossi switched from Yamaha to Ducati this year; the G.O.A.T. suffer a shoulder injury before 2011 season and struggled with the Ducati chassis all year long. The Italian outfit is known to have problematic chassis. In the past Casey just rode around it, but Rossi is a hard braking, front end guy; without proper front end feedback, the Italian can't ride around the problem like Casey does. Casey is known to have a "balls to the wall", win or crash style. In the past, data showed Casey lost his front end 3 times a race on average. In 2011 Rossi struggled to challenge for the podium on the Ducati Desmosicidi, it was obvious to see his racing line this year didnt allow him to the have maximum lean angle and exit speed that he needed. While the Honda and Yamaha are at full lean and ready to accelerate off the apex, the Duc just struggled to make the bike to turn. Hopefully 2012 will be a better year for the Italian and allow him to re-write the history books with an ultimate record of 10 Titles. The #58 Italian rising star was riding the satellite team Grensin Honda in the Sepang round of MotoGP. The Young Italian had extraordinary skill and was often able to challenge for podiums against the other factory riders this year. Marco finished 2nd in Philips Island Australian round motoGP the weekend before, which was his personal best result in this premier class of Motorcycle racing. Sadly, during lap 2 of Malaysian round MotoGP, Marco lost his front end and was hit by Colin Edward and Valentino Rossi who were following closely behind. The 2008 GP250 class World champion shortly passed away from chest and head trauma. Marco was 24 years old. We will never forget you SuperSic!!! Motogp Veteran Carlos Checa (Ducati 1198) and Marco Melandri (Yamaha R1) duke it out this year in WSBK. 39 years old Carlos "Chucker" finally won a World championship, and I'm glad to see this Spaniard succeed. Marco Melandri had a great run in his new refuge after leaving MotoGP without a ride. The Italian put out an exceptional performance this year and proved his talent is well worth a watch in this battle ground. Unfortunately Yamaha announced they will exit World Superbike in 2012 season, Marco will ride with the BMW World superbike team next year. I generally don't follow this left turning, live axle, speedway racing league. Not that I dislike this spectator sport, I still have a lot of respect for them but it is just not my cup of tea sometimes. This year however, Tony Stewart caught my attention. Stewart won FIVE out of ten Championship chase races; in the very last race he drove his heart out, over took his rival Carl Edwards who qualified pole in this final race and tied in championship points against Edwards. Because Stewart won more races than Edwards, he became the 2011 NASCAR Sprint cup Champion. Hats off to Tony for his extraordinary performance this year! World Rally Championship (WRC): This year the rules changed and everybody is running the "Super2000" chassis. Pirelli tire is exiting their long haul campaign in WRC arena to focus on Formula One. The French, Sebastien Loeb won his 8th consecutive World Championship title. Good job Sebastien! I do not follow the 240mph super speedway open wheel racing league closely. But a tragedy happened this year. Dan Wheldon passed away at the Las Vegas Motorspeedway from a horrific crash. The 2 times Indy500 winner, 24hrs of Daytona winner, and 2005 IRL series champion will always be in our heart. I hate to talk about myself but 2011 is a pretty good year for yours truly. I picked up a brand new platform and went to town with it representing RaceFriv. I finished on podium in Divisional Race with my co-driver AP1 S2000. And I won multiple races with my new Hyundai Genesis Coupe. I didn't have access to R-comp race tires until mid October, but the last 2 races of the 2011 season were excellent. By the end, I finished 3rd in the final regional championship in Buccaneer Regional Coastal Empire Region. My goal for next year is to win the Regional championship, win at least one Divisional race, and finish on podium in the National Tour! Phil you are awesome. Next year you will OWN.